In a industry of endless variant figures, I was honestly kind of surprised that Harleen Quinzel, the Psychiatrist that becomes Harley Quinn, has never had an action figure before — and yet, 23 years after her début, here we are: the toy for people who prefer craziness in a lab coat rather than a harlequin’s outfit. 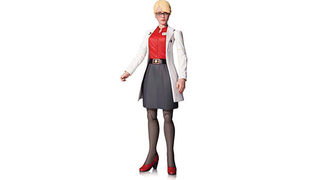 The figure is based on Quinzel’s appearance in the video game Batman: Arkham Origins — and I guess this is the point that you realise that a Harleen Quinzel figure is basically a “woman in lab coat” action figure once you get past that Batman significance, which is hardly the most exciting toy in the world. But hey! Lady scientist action figure. Lovely. The good news for Harley Quinn fans is slightly tempered by the fact that the only way to get Harleen is in a three pack with the game’s versions of comic book characters Lady Shiva and the Electrocutioner, when it releases in December for $70. That’s quite a bit of money if you just want Harleen, but both Shiva and Electrocutioner look pretty good! An uh-mazing two pack of Harley and the Joker based on their appearances in the Eisner-winning one shot Mad Love, a Paul Dini penned comic that told the origin of Harleen Quinzel for the very first time. Even better? It comes with the paperback edition of Mad Love too! That’s great. The two-pack will be available a wee bit before the Quinzel figure, in September, for $45. What a time for Harley-loving figure fans the end of 2015 is setting out to be!